Why do I work in the theatre? Firstly - in the theatre I usually encounter texts which lived on beyond their time and became immortal. I do my best to understand what Shakespeare, Chekhov or Strindberg are saying to me. I don't alter their texts, I don't "improve" on the scenes, I don't change or adapt dialogues. For weeks on end I read the text together with the actors in the belief that I shall finally find the answer. This work makes me better, more mindful, and also more ambitious, because I know that I am only one of the many people who did the same thing before me, hoping to uncover the mystery. The quiet, peaceful, analytical rehearsals, lasting for many weeks, let us come closer to the secret of Hamlet, to understand the despair of the Three Sisters, when at the end they cry "To Moscow, to Moscow...", and to grasp the iron necessity of the erratic and unpredictable construction of Ibsen's Peer Gynt. In theatre the director must follow the text; all his discoveries are mere consequences of his deeper perception of what the author has written... The director's role, of necessity much exaggerated in the cinema, is thus strictly defined. In the theatre I meet the actor eye to eye. I must endure that look. I must answer his every question (sometimes the answer is: I don't know). I can't hide behind the camera, as I sometimes do when making a film, or send him to one of the many people, walking about on location. The actor in the theatre is conscious that it is he and only he who shoulders the blame for the failure of the play. This gives him a feeling of self-value, while many film actors, especially those who do not appear often, feel mere pins in the huge machinery of cinema. Analytical rehearsals, workshops, stage rehearsals, endless talks in and out of the theatre bring me closer to the actors, allow me to know them better, discover more about them than in the inevitably superficial contact of filmmaking, when I am so out of breath that I can't even find the time to get down to first-name terms. Over the table, which only divides me from the actors, I look into their eyes, because I know that I can't hide my ignorance. Film actors are usually perfectly able to manage for themselves, quick to suggest various solutions, they are flexible and determined at the same time. These are not always the best actors to be found in our country. Frequently one small group plays in almost all the films, so it is sometimes good to introduce somebody new. But the practical knowledge of the actors' market is really only an incidental reason for working in the theatre. Because this work really teaches me something more - to be true to the actor. Here I must forget all the formulas I use in filmmaking: "This we shall edit out, that will be highlighted by music, this won't be seen on the screen". The third lesson I draw from the theatre is the contradiction between the "naturalness" of cinema, which imitates reality, and the "artifice" of theatre. The theatre requires from the director a much greater sense of form, an ability to mould all the things happening on the stage into a stylistically consistent whole. 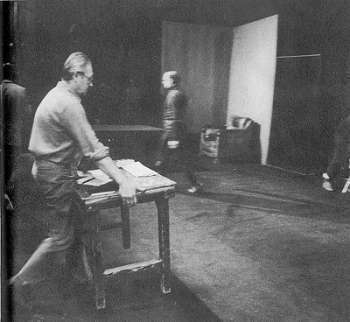 Many years ago I directed a theatre version of The Possessed based on the novel by Dostoyevski. During the morning dress rehearsal one of the actors clutched a chair in a very unnatural way and then, equally unnaturally, collapsed on the floor. On seeing this from the auditorium I immediately moved to his rescue. Why did the true gesture of this sick man strike me as suspicious and "unreal"? Because its reality was not theatrical, it did not involve the necessary transformation - it imitated death instead of giving it form. If the same thing happened in a film studio, I am sure that nobody would have tried to rescue the actor, being simply convinced that his acting is very good. Many similar experiences of the theatre have taught me to discern between the natural and the real. Theatre is an art of form. It deeply abhors the imitation of life, which is the lifeblood of cinema. The place of the theatre is on the stage and in the auditorium. The actor and the audience are two indispensable factors of its existence. So the director's position is actually very modest - to help the actors, to keep up their spirits, and to be their first viewer in an empty auditorium during rehearsal. To see they do not disturb each other, to extract everything that could be helpful in the understanding of the plot and content of the play. That's a lot and very little, depending on how we approach the task. I am often asked why I work in the theatre, though its achievements disappear in time and are so easily forgotten, when I have the opportunity to make films, which are lasting and stay for ever, having the chance to amuse and affect future generations? Well, it is exactly this transitory and ephemereal character of the theatre which I feel deeply and truly drawn to. There are other natural needs of man apart from the search for immortality and the will to survive; we are also attracted by death and nothingness, the more, the older we get.